Non-toxic play yards and travel cribs. As your baby grows and possibly outgrows the bouncer seat, you may find that she will enjoy spending time in a play yard with a few toys. 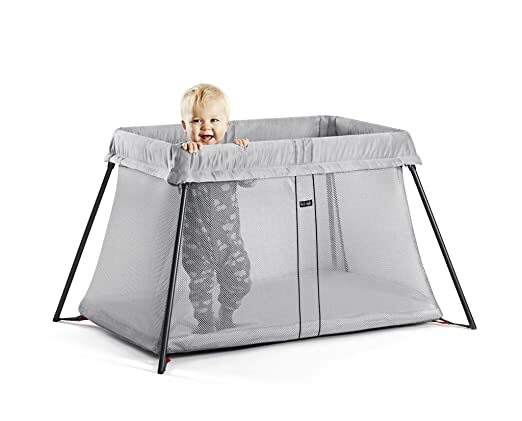 Using a play yard (or travel crib) will provide you with another option for hands-free baby time. (Do you also have a good organic baby carrier?) It provides a safe space for your baby to play while you can’t hold them. Or you may use a travel crib for occasional naps. Either way, I recommend investing in a travel crib made with safer materials than mainstream alternatives. Here are my favorite non-toxic play yards and travel cribs for you to consider. Here are the best options for non-toxic play yards that are currently on the market. Made without flame retardants, PVC, BPA, lead, and phthalates, the Guava Lotus Crib is a lightweight travel crib that folds down very easily. 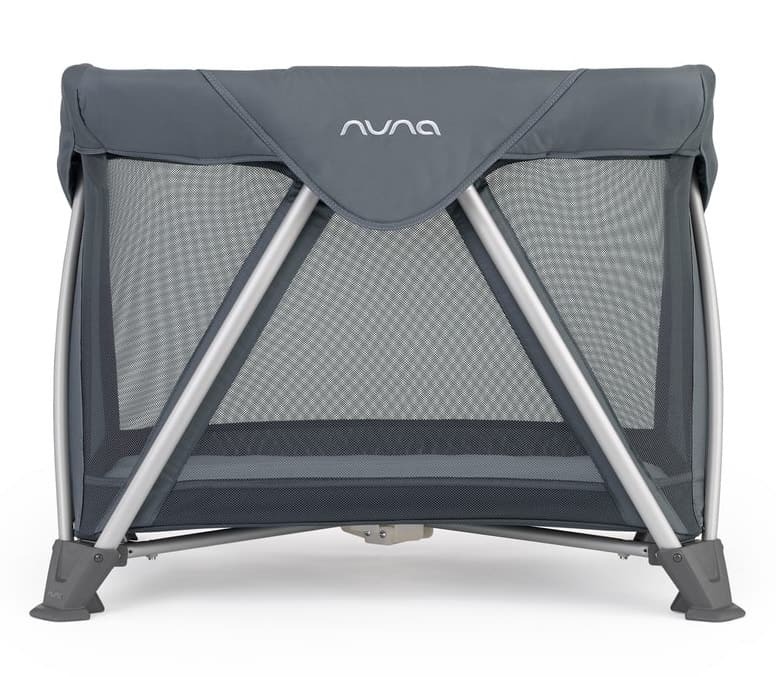 With generous breathable mesh sides, the Guava also has a unique zip-down side door that can be fun for you and your little one as they begin crawling and standing. This makes it convenient to play with your little one as they get older. As far as portability goes, the Guava is super lightweight and folds down to a backpack. It can be checked on a plane or brought on as a carry-on item. The fabrics used are GREENGUARD certified, and the crib itself is low-VOC. The only downside I can list to this travel crib would be that I felt the base was a little less sturdy than other play yards; though to be fair, other play yards often have overly rigid surfaces. Guava also introduced a bassinet conversion kit that converts the Lotus crib to a bassinet, giving you a truly non-toxic bassinet. Overall the Guava Lotus is an amazing, non-toxic travel crib! The Nuna Sena Play Yard is also a fantastic choice for non-toxic play yards – possibly even the best on this list. Versatile and lightweight enough to be used as play yard or travel crib, the Sena Aire cots fold down easily with one hand and come with a travel bag and GOTS-certified organic cotton sheet. The full-size version also offers a bassinet option that folds down with the crib (that’ll come in handy!). Newly redesigned, the Sena Aire play yards feature a soft, plush cushion for your little one, with padded edges and a skid-proof bottom. I like that the base doesn’t hit the ground, offering a firmer sleep and play surface than the Guava (which I still love and rave about). The Senas now offer 360° of ventilation, providing your baby breathable sides for safer sleep. If you buy the full size Sena Aire, you can add on a changer accessory to make diaper changes more convenient. Not only that, but the cover can be removed and is machine washable. Trust me, this will be very useful! And last, I have to mention that this is a good-looking play yard that will look great in your home. Lightweight and easy to fold up, the BABYBJORN Travel Crib weighs in at 13 pounds. 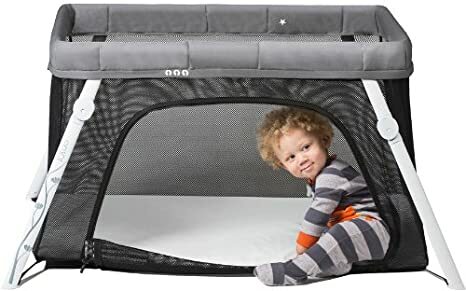 This is a great choice for a travel crib, or even just a portable crib for use around the home. It comes with a comfortable mattress and features generous breathable mesh sides for maximum air ventilation. One thing to note is that the mattress does sit on the floor, which you may or may not like. But otherwise, this is a great play yard – especially for travel purposes – and is definitely worth considering. The fabrics are machine washable and Oeko-Tex certified. 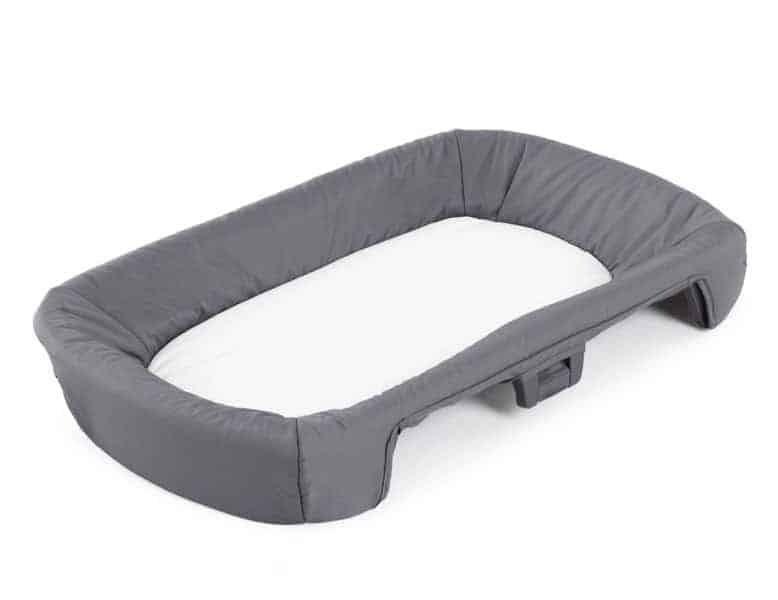 Again – this is a top choice for a lightweight non-toxic travel crib! Which play yard did you choose? Be sure not to miss my guide to non-toxic bouncers, which are a must-have, especially for the newborn phase. Hi Sue, the mattress is made from polypropylene boards and a polyester mesh cover. Polypropylene is one of the safer plastics available. They provide an organic sheet, which is nice. As mentioned Nuna makes an effort to use safer materials in their products, and it’s one of the better non toxic play yards. Have you also looked into the Guava?? It’s awesome and they’re very upfront about what’s in their products. Thank you – I also like Guava but my concern is that my cat may reach up to the mesh bassinet and could accidentally pull it over – the Nuna Sena Aire appears to be more stable in this case – would you agree?